This came to mind when I checked out the recently update best coolers list and noticed the dark rock 4 there. I then went to the bequiet! website for more info - specifically the dark rock pro 3 & 4. I wanted to compare them to the D-15(I mean, why not?). So both of those coolers are rated for 250w tdp cpus, while the D-15 for 165w. But it looks like the D-15 cools better than both? Is there something I'm not aware of? Granted, the articles I read didn't test with cpus of relatively high tdp, just 95w. So, using an overclocked 7820x(140w+ tdp), would I get better temps with one of the rocks? Or is the 250w tdp a load of marketing nonsense? This seems to be a popular question lately. You're better off with 250W. Here, go nuts reading this. 2. Heat soaking. If the heatsink becomes warm, it will lose performance. A TDP of 140W means it can output 140W of heat without getting too warm. 3. Looks scary. Just joking. But bigger TDP literally means bigger size. So the airflow of the case or an extra fan cools it better too. 4. there may be more. Can't remember. Also, your 7820X OC with the voltage set to 1.28v can draw nearly 180W under heavy load. You could go higher to 200W+ with more OC too. Most probably, it's padded marketing nonsense. Realize that BeQuiet is a fully commercialized manufacturer, churning out products in mass quantities, with both high and low quality products at a variety of price ranges. Notice on the Noctua website the D15 is rated for 165w AND **OC. Likely this puts it in the 200w category. Noctua is an EXACTING manufacturing and desgin company, with no embellishments or false claims. They spend YEARS developing a particular product before releasing it onto the market. BeQuiet has some very good products, when specific criteria are met, but they do not produce products on a similar level with Noctua. Anybody who says otherwise probably has little experience with Noctua products or does not understand fully the processes involved in product testing and how to ensure reliable results across a variety of test platforms. The BeQuiet coolers are good. Much better than a lot of what is out there. The Noctua coolers are better quality and are designed and engineered to a higher standard. If you are looking for maximum cooling performance, I'd suggest looking at a D14 with newer fans. It will outperform the D15 using the same fans. I believe it's just differences in marketing - and only on the Intel front. For AMD (at least AM2/AM3), the NH-D15 is rated for 220W. Noctua list the maximum TDP of chips, stock... and use "+OC" in addition. They also have their own specific coolers for TR4, which is where you start seeing 250W "stock" CPUs. By the time you OC a 165W TDP LGA2066 (i9-7980XE etc), you probably be in 250W territory anyway. Well, I can't agree Barty. 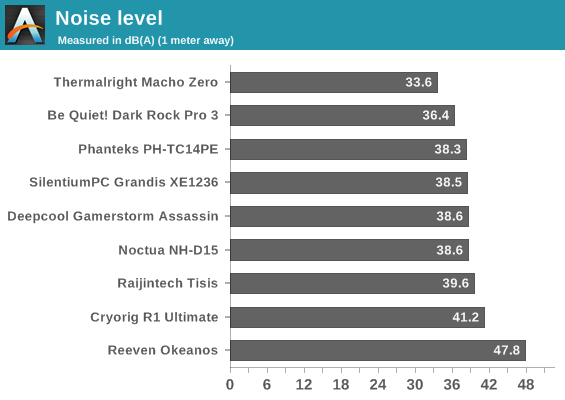 We know the Dark rock Pro 3 doesn't beat the NH-D15 in testing, and since the D14 with newer fans beats that, it stands to reason that the D14/Fan combo probably beats just about everything out there that isn't big water including the Thermalright Silver arrow IBE. Everything else you said seems right though. Didn't see your mention of the newer D14 darkbreeze - good call. I was talking specifically on the DRP3 (overlooked mention of the DRP4) and NH-D15 though. I did say "rival", not "beat". The NH-D15 will outperfom the DRP3 in strict cooling (~4'C dTa) at the upper end of TDP ratings, whereas the DRP3 offers either similar, or lower noise (depending on the specific review consulted). To me, that puts them in the same general ballpark. Agreed though, the new D14 is the better route to go, and the DRP4 should be avoided outright. There is no "new" D14 that I'm aware of. It's just D14 with newer Noctua fans added. Obviously, this increases the cost, but honestly, you can probably find a used, good condition D14 for about half the price of a new one, and it's not like these things "wear out". If it hasn't been intentionally damaged or had the fins smashed to hell, it should perform as good as a new one. You can always either sell the fans that come on the D14, or use them as case fans. Theres a revamp of the D14 with the newer fans, is there not? So that's how it is. I thought it was a bit of a stretch, when tests have shown the D-15 to be the stronger cooler. And I already have a D-15S in dual fan mode, so performance is almost identical with the regular model. I saw that 250 tdp, and was like, "Whoa, I should have an even easier time cooling my cpu with this thing! But, I should see how it holds up against others..." Then I see the numbers, and "The heck? That doesn't add up." Well, D-15 would be the revamp, wouldn't it? The former was discontinued afterwards. Then, the industrial, chromax, and redux fans were added. It goes without saying that I am interested in a strongest AIR cooling solution for this cpu, but there doesn't appear to be one superior to the awesome d-15 at the moment, aside from a d-14 with redux fans, as mentioned by darkbreeze. Some air coolers are getting up near the D15 in performance, but it's still pretty much the gold standard from a performance standpoint..... Stock looks on the other hand, love 'em or hate 'em. Personally, I like the Noctua look... but I did eventually pick up some Chromax fans for my D15. Yes, the D15 was based on the D14. I was mis-remembering. I thought there was a "new" D14 at Computex... but it's a revamped U12 I was thinking of. As the person that does the tests for Tom's Hardware for big air cooling, much of what is being discussed is pretty spot on. 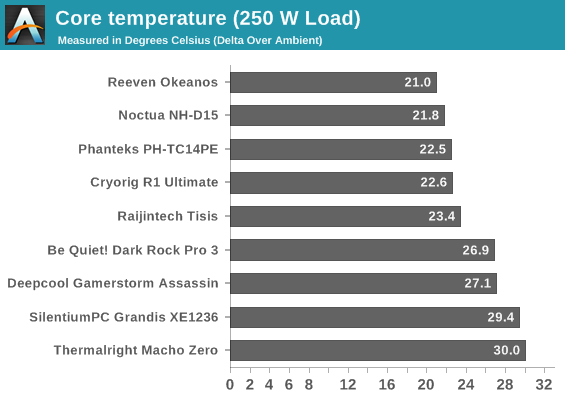 The ability for a cooler to actually cool a given amount of thermal load also depends on how well it does so - and while a 250w TDP might be advertised, it doesn't really discuss at to what temperature delta. Sure, you can dissipate 250w, but how quickly and how efficiently? This is why we test at 100% and 50% fan speeds to see where cooler weaknesses lie. Personally I really like the be quiet! Dark Rock series - they are some amazingly designed, high quality coolers that look great. However, Noctua just seems to be a half-tier higher in terms of build quality, materials and performance. The only reason I chose be quiet! Dark Rock 4 Pro as the current big air 'go to' is because Noctua hasn't had anything new to test recently and everyone already knows how impeccable the D14 and D15 really are, so nothing really new there except old news. I personally would LOVE nothing more than to test an updated big cooler from Noctua...I did the three Threadripper coolers and couldn't be more impressed with them. I'm a high-end watercooling guy in my heart (15+ years) and AIO liquid coolers just don't do it for me...but good air cooling is rather exciting. You should do your own test of the D14, if you have access to one, with some different fans like in the article I linked, to verify whether that was an accurate conclusion or not. Maybe test the D15 with those same fans too. Not that I don't believe their results, but I believe yours more. We try to stay with the boxed components for a cooler simply because that's what Joe User will be presented with. There have been a few times here and there where we stray a bit for 'what ifs' but it's generally not recommended unless there is a really good story to go along with the change. IDK, I think the idea that you can get better performance out of an older cooler with new fans, than you can from Noctua's current flagship cooler, is a pretty good story. Granted, it's already been done, but I wonder how applicable this is to a variety of other heatsinks that used to be enthusiast staples. thermalright also has just released a new silver arrow ib-e extreme 2. it comes in black or silver finish. The U14S is a single fin stack, single fan cooler. It does not perform anywhere near the D15. I have the U14S on my 6700k@4.6Ghz, so I know that's it's a very capable cooler. But it's not going to handle the same kind of TDP that any really good double stack cooler will handle. The laws of physics say that it simply cannot, because it does not have the same surfact area for heat transfer. I would not personally recommend this cooler for any processor with more than 4/8 cores/threads, IF you are planning to overclock. If there will be no overclocking involved, then the U14S should be good enough for a 6/12 CPU. Really, much depends on three things. Clock speed, number of cores and of course how that translates into TDP. If the TDP of the configuration, factoring in overclocking or turbo speeds, is not going to exceed 165w then it should be ok. You must also realize that just because the paper specs say a product is capable of supporting a given TDP rating, does not mean that it will do it equally well as another product. The U14S might work with an overclocked 165w TDP CPU, but it's going to be right at the edge of what it can handle and is probably going to have a fan that is running full out almost anytime you are doing anything even remotely taxing. Something like the D14, D15, Silver arrow, R1 Universal, Dark rock pro 3, things like this, are going to more easily transfer heat away from the processor without the need for full on fans ALL the time. Coolers like these could likely even be used on lower end CPUs like older dual core i3's or current Pentiums without even needing much help from the fans, or any fans at all, simply cooling passively. That of course has not been tested so nobody should take that literally. It was merely meant as as example. No doubt D15 has a larger surface area than U14S, but the difference may not be as big as you'd think. Don't get me wrong, D15 is still a gold standard in air cooling performance but the difference from U14S isn't as great as you'd think.... these reviews give about 2-5C advantage under overclocked stress load. I've read every review out there on the U14S, believe me. I've tested it myself on a variety of platforms and under a variety of conditions, using different fans, and different combinations of fans. I've tested it using different thermal compounds. I know full well what it can and cannot do when used on several different platforms with different processor SKUs. I have not tested it on very high core count, high TDP processors though, however, having tested it on several different 4/8 processors and having found it to work well, but be right at the edge of what is acceptable when overclocking, there is no possible way I could recommend it for use with higher core count, overclocked processors. None. Understood. I’ve found quite acceptable temperatures with U14S cooling a few i7-5960X boxes tho. They are overclocked to 4.4ghz, but the haswell-e series HEDT chips do have soldered TIMs. And that probably makes a giant difference as well. If all these CPUs had soldered TIM between the die and heat spreader, they'd ALL run a lot cooler and be easier to keep thermally compliant, especially when overclocking. Unfortunately, most of them don't anymore. As far as using this cooler for a 1400mhz overclock above the base clock, on an 8/16 chip. I guess I'd have to see the results of full stability testing, like 8 hours Prime Blend and 8 hours Realbench, to believe that the voltage being used was high enough for full stability and low enough for thermal compliance using that heatsink. But that's a whole other topic that is not really relevant to this thread.